I’ve always been grateful in mid-winter for having a big imagination. There’s real escapist value to mind traveling. Great memories from years ago conjured up on a dark winter day- come rushing back to inspire and entertain. I offer up the arts as a worthy pursuit for respite in a busy world. The arts bring downtime for contemplation. 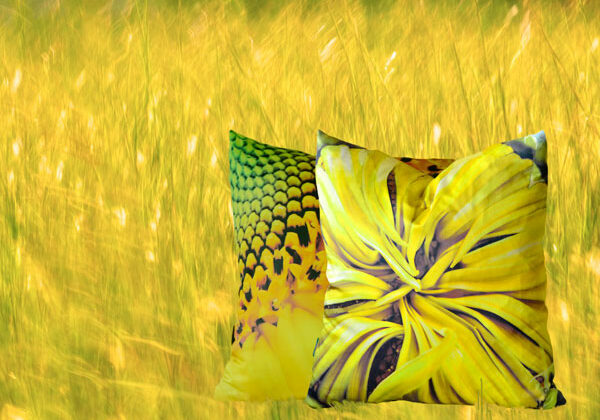 For myself, I escape while creating art for my pillows- discovering new angles or combinations of photos that work well in three dimensions. Or, as in this image- creating a mood just for fun with two of my fave summertime sunflowers. Paola pillow flowers can be enjoyed everyday, all year. No travel required!